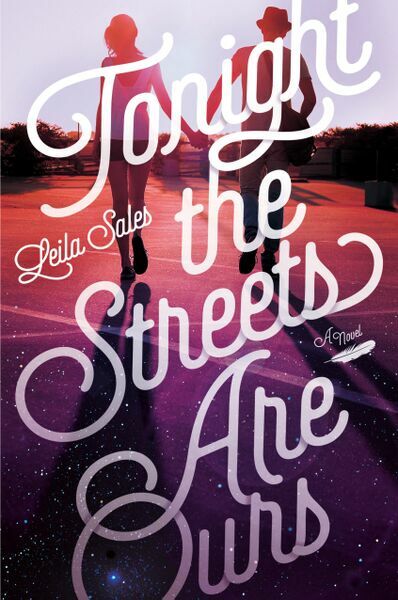 I'm so excited to be a part of the blog tour for Tonight The Streets Are Ours! My review will go up next week, but I can tell you all that I'm seriously impressed by Leila's storytelling and characterization. Plus, I adore Leila. She's one of the sweetest, smartest people in publishing I've ever had the fortune of meeting and talking to. Alexa Loves Books (ALB): Hi Leila! I'm so happy that you're dropping by the blog today to answer a few questions. First up, I love a good road trip! If you were planning one of your own, where would you go? What would you do along the way? And who would you go with? Leila Sales (LS): There are so many parts of the world I want to explore. Show me any place with beautiful architecture and intriguing history, and I'm in. Right now, I'm considering a road trip around the south: Nashville, Charleston, Atlanta, some adorable small towns. I'd also love to see more of California. I grew up outside of Boston and now I live in New York City, so I know the northeast much better than I know the rest of the country. On my road trip, I'd take with me my writing partner, Rebecca Serle. She and I once did a road trip to Williamsburg, Virginia, when I was researching Past Perfect. We never ran out of things to talk about or 90s boy band songs to listen to. ALB: You've just decided to stay up all night, and you've decided you want to throw a party. What would your theme be? Feel free to share the dress code, entertainment, and plans for refreshments and giveaways if you're so inclined. LS: Theming parties is one of my greatest joys in life. Like one time, I threw a blender party, and I got four blenders, and instructed everyone to bring fruits, juices, ice cream - anything that could be blended - and then we just threw things in random combinations into the blenders and drank them. I woke up the next day and my entire apartment was sticky. For my 20th birthday party, I took over an entire floor of my college dorm. The theme was "frivolity" so the playlist was all pop music, the drinks were all bright colors, the food was all brownies and cookies, and I wore a pink dress, pink sneakers, and giant pink plastic hoop earrings. For my 29th birthday party, my theme was "Friendship is Magic" and everyone was supposed to dress in a way somehow inspired by My Little Ponies. These are just examples. I could keep going. There is no party that's too intensely planned for. ALB: Leila, I officially want to be invited to one of your theme parties because they sound awesome! Ahem, moving on to the next question... It's always fun to meet someone famous! What's the craziest celebrity/author encounter you've had so far? LS: When I met Zilpha Keatly Snyder at ALA a few years back, I bawled like a baby. Her books really helped me get through middle school, and it's impossible to thank someone enough for that. The first author I ever met was Dave Barry. I was fourteen years old and super nervous, and I practiced what I was going to say to him for about an hour. And still my words did not come out right. I've met him at other signings a couple of times since then, and I just try to act normal. That's usually my goal when I'm around celebrities: just act normal. Also, I once got a book signed by J.K. Rowling! (ALB: Me too!) I wanted to ask her, "How do you do it?" but then I realized that was not an actual question - or at least, not a question with an answer - so I said nothing. ALB: Don't worry - I was exactly the same way when I met J.K. Rowling! Okay, nowadays, everyone is connected through social media. What is your favorite form of social media and why? LS: I like Facebook a lot. In 2004, I wrote this piece for my college newspaper in which I described Facebook as "the greatest thing since Karl Marx". Weirdly, I was kidding at the time, but in the past 11 years, it's actually turned out to be kind of true? And I just got into this new app (because I am soooo cutting-edge). It's called Cymbal, and it's like Instagram for songs. My username on Cymbal is prettytothink -- come join me there and let's listen to music together. ALB: I'll have to check out Cymbal! Okay, last question. Living in NYC these past few years has been a total dream, and I've gotten to see some awesome sights and attend great events. What are things you'd personally recommend to people visiting NYC? LS: Food stuff, obviously. Get ice cream at Ample Hills, cookies at Levain Bakery, and pizza at Forcella or Roberta's or any other amazing pizza place here. Go to a show. There are great bands playing every night, and you can find out about them on Oh My Rockness. Go to a dance party. Those you can find on You Don't Have 2 Settle. See a play. There's some great stuff on Broadway right now (I loved Hamilton and Something Rotten! ), but there's always good shows off-Broadway too. Hit up some extremely themed bars, like Camp (where you can roast your own s'mores), Full Circle (where you can play skee-ball), the Royal Palms (where you can play shuffleboard), Union Hall (where you can play bocce). And just, like, explore and see where the day/night takes you. My most memorable NYC experiences are usually those where I just said yes to whatever opportunities came my way. LS: Living in New York, I bet you get to go to a lot of book events. (And sometimes I get to see you at them!) About how many would you say you get to go to each year? What are some of your favorite book event memories? ALB: Oh, I adore this question! I'm a very, very lucky girl because book events happen all the time in the city. This year alone, I've been to 16 events so far, with a few more coming up through the rest of the year. And that's not even counting BEA and ApollyCon, two conventions I was very fortunate to attend! Honestly, I love going to book events because I always enjoy getting to meet and talk to my favorite authors. That's the thing all of them have in common - I genuinely adore the author I went to see, and I walk away with the special memory of meeting them, chatting, perhaps taking a photo and grabbing a signed book. But hands down, one of my favorite book event memories this year was getting the chance to moderate a Barnes and Noble event for one of my favorite authors ever, Sarah J. Maas! I was so nervous, but it was so easy to chat with Sarah and I was so happy to be able to do something like this to support her book. LS: One of the big issues in Tonight The Streets Are Ours is how we curate and manage our online appearances (sometimes to make ourselves look cooler/prettier/happier than we are in real life). Would you say that your persona on your blog is any different from your persona in the real world? ALB: This is another excellent question! I think about this exact thing every so often, whether it's individual retrospection or in conversation with someone else. Truthfully, with my blog (and Twitter and Instagram and YouTube), what you see is what you get. I'm really a positive person, and I get along with people in real life as well as I do online. And my tendency to babble always manifests itself one way or another! I've had people tell me that I am exactly the same, online and in person. But, in all honesty, I do think that what I present online is only one part of who I am. It's obviously biased towards the positive, where I focus on the things that make me happy or excite me. I very rarely talk about the hard, sad stuff that happens in real life. Most of that stuff revolves around more personal matters, which is why I'm very private about it, though on occasion I'll make allusions to it. There are just some things I'd rather keep off the Internet. ALB: Just one piece of advice? That's such a challenge because there are so many things I'd like to say to someone who wants to start a blog. I guess, if I were going to choose just one of those things, I'd tell them to think about the type of blog they want to run. I'm not referring to content or subject matter, though it would be great if you could have a basic idea of those things too. What I'm talking about is your approach to it. Are you blogging as a hobby? Are you blogging as a professional? That demarcation will determine your approach and presentation, and is a good place to start. LS: What's one thing you wish all your readers knew? ALB: I've shared a lot about myself, so I'm pretty sure most of my readers know a lot about me! But I guess I wish my readers knew that I love talking about books. And when I say talking, I mean engaging in seriously lengthy discussions, whether of the analytical or fangirl variety. I can talk about books and authors all day, every day. It also makes my day whenever someone tells me that they've read a book because of my recommendation - and that they loved it! LS: What's the hardest part about being a blogger? There are two things that I think are difficult about being a blogger. First, I think it's hard to avoid putting pressure on yourself, particularly if you're Type A like I am. I obviously always want to do the best job possible, which means consistent and well-written content, and constant audience growth. I often have to remind myself that perfection isn't necessary, that I have a lot to be proud of and that it's okay to make mistakes. Second, I think it's hard to decide where your boundaries lie. It's important to know what you're willing to share and what you want to keep private, especially when you talk about people in your real life (which I do). I try to be considerate of their feelings, and I also try to recognize when something shouldn't be shared anywhere online. And check out this awesome thing happening on September 19! Starting at sundown, and going as late as you want, do something fun, make a record of it, and share it with the world. Using the hashtag #TonightheStreetsAreOurs, Instagram or tweet whatever happens in your night. If you're going to a party, aimlessly driving around with friends, or watching a movie alone in your PJs, we want to hear about it. Whatever you're doing with your night, wherever you live, however old you are: you're invited! Leila will be livestreaming her own nighttime adventures, which you can join her on remotely HERE. Plus, there are multiple chances to win a signed copy of the book, so be sure to check that out! Wonderful questions, Alexa! And thank you, Leila for you answers! I'd love to read this book because I've heard amazing things about this! Thanks so much for the giveaway! I love a book with a road-trip, and I really enjoyed This Song Will Save Your Life, so I'm excited to read this one as well. Thanks for the giveaway! Loved this post. Both Leila's and your Q & A answers were fascinated. I absolutely loved this book and am so excited that more people are going to get the chance to read it soon!